U.S. approves plan to build first American factory in Cuba in half century. 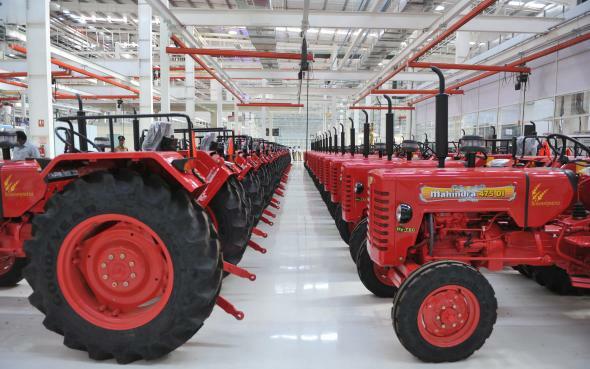 A tractor manufacturing plant in Zaheerabad, India on March 6, 2013. The United States has approved the opening of the first American factory on Cuban soil since the two countries began severing diplomatic and economic ties more than 50 years ago. The Treasury Department notified the two-man, Alabama-based company last week they had the go-ahead to open a plant to build tractors and other heavy equipment. The [-] plant would be the first significant U.S. business investment on Cuban soil since Fidel Castro took power in 1959 and nationalized billions of dollars of U.S. corporate and private property. That confiscation provoked a U.S. embargo on Cuba that prohibited virtually all forms of commerce and fined non-U.S. companies millions of dollars for doing business with the island. Letting an American tractor company operate inside a Cuban government facility would have been unimaginable before Presidents Barack Obama and Raul Castro declared on Dec. 17, 2014, that they would restore diplomatic relations and move to normalize trade, travel and other aspects of the long-broken bilateral relationship. The Oggun tractor plant, once up and running in a special economic zone 30 miles west of Havana designed to attract foreign investment, will be capable of producing as many as a thousand easy-to-repair tractors each year to sell to private farmers for under $10,000. The American investors say they expect to employ 30 Cubans to start and as many as 300 within five years time. Cuban officials have already publically backed the deal.